WIRED FOR SUCCESS OR DESTRUCTION? Seoul, South Korea (CNN) --- The first thing you notice about the professional video game players are their fingers -- spindly creatures that seem to flail about at their own will, banging at the computer keyboard with such frequency and ferocity that to visit their live-in training centers in South Korea is to be treated to a maddening drum roll of clicks and clacks. The clatter is loud enough to drown out conversation. And it's constant. Rows of expressionless young men sit at cubicle-like workstations tapping at a galactic military strategy game, "StarCraft II," sometimes for 18 hours a day -- from 10 a.m. to 4 a.m.
One of them is "MarineKing" (real name, Lee Jung-hoon; age, 19; annual earnings, $105,000). His digits rap like machine-gun fire at a black keyboard; the twitchy glow of a computer monitor reflects in the lenses of his purple glasses. MarineKing lives with fellow members of his team, called Prime, on the 16th floor of a high-rise building west of Seoul -- an ultra-wired city that takes on an intense, digitally enhanced quality after dark, with neon lights and big-lettered advertisements lighting up a sea of skyscrapers. It's a place that's home to the world's finest "e-sports athletes," as they're called here without irony. It's also a hub for gaming addiction -- a place where deaths are attributed to games and the government funds treatment centers. MarineKing knows those facts all too well. He's been caught in a lifelong struggle between the dark and the light sides of gaming. It's a struggle that at times tore his family apart. When I visited MarineKing in December, he was preparing for the Olympics of the video game world -- the World Cyber Games. There, he would compete against his chief rival, "MVP," who was ranked No. 1 heading into the tournament, to MarineKing's No. 2. In previous professional battles, MVP (real name: Jung Jong-hyun; age: 21; annual earnings: $250,000; team: Incredible Miracle; sponsor: LG Electronics) had always triumphed. That rivalry wasn't MarineKing's biggest concern, though -- not really. The scrappy, frustrated underdog cared more about proving to his parents, and to himself, that he was not addicted to the video game that had come to dominate his personal and professional life -- that he's a pro, something his mom and dad should be proud of. "I am very desperate," he told me through a Korean translator. "I really want to win." To impress his father, he wanted to be the world's best. And at the World Cyber Games, his dad would be watching. MarineKing was still a young boy -- first or second grade -- when he discovered and fell in love with "StarCraft," the game that would become a source of joy and obsession for him. He first saw the game on national television, played by paid professionals. But the game's storyline is what sucked him in. Set on a distant arm of the Milky Way, "StarCraft" is an epic battle between three alien "races" of characters -- one that's human-like, one made up of insects and another that's "humanoid," a cross between robots and people. Playing as the human-like "Terran" race in the game, MarineKing found a sense of control in "StarCraft" that he didn't find elsewhere. "When I played 'StarCraft' for the first time, it was like a fantasy. I felt like I discovered a new joy in my life. I was so excited that I could become a controller -- or fight against monsters." In real life, he was shy and bright, but not all that interested in schoolwork. He started skipping after-school classes to go to a PC bang -- Korean for "PC room" -- in Changwon, his hometown, where he played "StarCraft" for hours on end. In the game, he belonged. He was a conqueror -- a general who controlled sci-fi armies and determined the fate of civilization. He drifted further into the game and, as his parents came to see it, out of the physical world. It was all fiction, of course, but it seemed real to him. And soon MarineKing started to like this fantasy world better than the real one. One night, in his journal, he scribbled a secret: "I want to grow up to be a pro gamer." He stuffed the note in the bookshelf of his bedroom and didn't tell a soul. MarineKing plays the real-time strategy game "StarCraft II" at the World Cyber Games in Busan, South Korea. The 2011 World Cyber Games opened with a battle. Two martial artists -- one dressed in black, the other in white -- became entangled in a dance fight on stage during the opening ceremony for the games, which was held at the Busan Exhibition and Convention Center in Busan, South Korea, a mountainous coastal town known for its beaches and fresh eel. The futuristic complex looks like a metal spaceship. The performers skittered back and forth across the stage, two-foot-long swords drawn and their tattered ribbons of clothing floating in the air. At the end, both fell to their knees in submission. Neither had won. Cannons fired smoke from the corners of the stage. Green spotlights circled, giving the place the air of a disco well after dark. The World Cyber Games theme song, "Beyond the Game," blasted at rock-concert levels, making some attendees cover their ears. Moments later, the competition began. Many of the high-profile matches at the World Cyber Games are played on stage in front of a live audience. Players sit in soundproof cubes so they don't hear the game's three Korean announcers, who sit at a cafeteria table yelling about whose army is advancing and who is about to get ambushed. The announcers wear white lab coats and glasses, giving them the air of scientists. One is a dead ringer for Dr. Bunsen, Beaker's sidekick on "The Muppet Show." A football-stadium-sized digital screen helps the audience follow the play-by-play. MarineKing's first match, however, was against a nobody opponent, so he was situated in a corner of the room, at a small computer terminal. He unpacked his black keyboard and headphones. A small audience leaned over a railing to get a look at their screens. When MarineKing isn't playing "StarCraft II," he's a Raggedy-Andy-looking character, with red pockmarks on his cheeks and a swoop of chestnut hair, which he dyes. At the training center back in Seoul, he wears a pink T-shirt and pajama pants with cartoon monkeys on them at all hours of the day. When he smiles, his cheeks touch his glasses. Like other members of his team, he sleeps in bunk beds with pink and blue sheets, like those of young children. All of this boyishness disappears, however, when he's in the game. He becomes intensely fidgety -- almost visibly vibrating -- before a match. In the game, he's a notorious aggressor, known for quick military strikes that give opponents no chance of recovery. MarineKing logged in before his first match and immediately started chatting with his opponent, using gamer-speak to tell him he was ready for battle. "go?" he wrote through an in-game chat program. His fingers were anxious to play. After typing "go" several more times, MarineKing started typing out finger-loosening exercises and sending them over and over again via chat. The characters look like nonsense, but they form repetitive patterns on the keyboard and MarineKing uses these exercises much like a pianist would when warming up. "go go," his opponent wrote, finally ready. The match didn't last long. After setting up a base in the northeast corner of the map, MarineKing sent foot soldiers to root out his opponent's headquarters -- a glowing blue pyramid spitting out blue termites -- and blew the whole thing up before the 10-minute mark. His coach nodded approvingly and walked away. MarineKing paid no attention to the press photographers leaning over a rail to snap pictures. He was busy surfing the Internet, looking at pictures of pigtail-wearing Korean pop stars. Then he quickly moved on to another round of "StarCraft" -- not because of the competition, really. He just wanted -- or needed -- to keep playing. Park Ae-young was cleaning her son's room when she stumbled on his private notebook. She opened it, she told me in an interview, to see if his homework was finished. But the secret she found was infuriating. It confirmed her worst fears: Her son, MarineKing, wanted to spend his life in an online world as a pro gamer. Park wanted her bright child to be a judge -- and she saw online games as a dangerous distraction. "We were really, really concerned about him," she said. "We asked him to stop again and again." It's easy to see how she would worry. She knew her family was living in the world's most wired country -- a place where talk of gaming addiction is on the minds of many parents. After investing heavily in broadband Internet infrastructure, and creating a network that is the fastest in the world, South Korea's government in recent years has launched a full-on assault against what it sees as the scourge of an over-connected digital life: Internet and gaming addiction. About 8% of Koreans ages 9 to 39 suffer from one of these new forms of addiction, according to a 2010 survey by the National Information Society Agency. At 14%, the addiction rate is higher for young people between the ages of 9 and 12, the survey says. A number of high-profile deaths have brought national and international attention to the problem. In 2010, a 32-year-old man played the first version of "StarCraft" for so long that he keeled over dead. He was so entranced, according to news reports, he didn't stop for rest for five days. Also that year, a 25-year-old woman pleaded guilty to negligent homicide after her infant died while she was playing an online game at a PC bang -- sometimes for 10 hours at a time, according to a CNN report. Her game of choice? "Prius Online," which asks players to care for a virtual girl as she gains magical powers and grows older. Park Deok-soo, director of South Korea's Information Culture Division in the Ministry of Public Administration and Security, said in an interview that treatment programs are often successful at grounding young people in the real world and curing them of gaming and Internet addiction. Take Seung, a 17-year-old I met in Seoul. He didn't want his real name used because of stigma associated with gaming addiction. Like MarineKing, he grew up idolizing the pro players he saw on TV. He told me he wishes he could stop playing, but he can't. He spends sometimes 12 to 14 hours a day, he said, tapping away on the keyboard playing online games like "Maple Story," "Sudden Attack" and "StarCraft." Seung attended several counseling sessions for gaming addiction -- supported by the government -- but said that wasn't enough to make him stop. He's not sure he'll ever be able to. "I feel like the game is pulling me," he told me in December. Much to his mother's dismay, MarineKing exhibited similar symptoms. In middle school, he started playing "StarCraft" all the time -- 20 hours a day on some occasions. He didn't eat or sleep. At first, Park tried to bring her son through this weird phase. She brought him snacks while he played, hoping to keep him healthy. But eventually she'd had enough. One evening, when she heard the keyboard clattering from her son's room in the middle of the night, she became furious. She didn't want this digital game to steal away her son. A middle school teacher already had flagged MarineKing as a potential gaming addict, after he took a government survey that asked about his use of online games and computers. So she cut electricity to most of the apartment. Without power, she knew he couldn't play. "We could hear he was playing in his room," she said. "We said, 'Stop it! You stop it, please! Please, please, please,' we said. So we thought if we turned off the electricity, he couldn't play the game. So that's what we did." Through the walls, she listened as the rapping of MarineKing's black keyboard fell silent. But the noises that followed were just as wrenching. "We could hear him screaming." One of the top online gamers of "Starcraft II" in the world, Korea's MVP, right, with his coach, takes us inside the life of a pro gamer. This troubled past hung over MarineKing as he moved on to one of his next matches at the World Cyber Games, one that would put him up on the event's bright-lit main stage. In the soundproof pod, he used his phone's camera as a mirror to check his hair. He brushed his chestnut bangs into a perfect swoop across his forehead before pulling up the hood of his team sweatshirt and then checking the arrangement once more. The three Korean announcers didn't pick up on his nerves. "He looks powerful!" one shouted into a microphone. MarineKing's competitor was DarKFoRce, from Germany, whose oily hair and sleep-deprived face made him look like the American stereotype of an obsessed video game player. As the match began, MarineKing's brow furrowed. His mouth closed. His eyes darted all over the screen as his fingers rapped at his black keyboard. He always starts his matches in the same way -- by ripping his fingers from one side of the keyboard to another, as if he's playing the piano solo in "Great Balls of Fire." The maneuver results in a rattling sound, like a barrage of explosions. This has a strategic as well as dramatic effect, since it allows him to select all of his military units at once so that he can put them to work furiously collecting supplies. Within minutes, he had built a veritable city in the southwest corner of the map, complete with barracks to house his troops. But, unknown to him, on the opposite side of this virtual game board, DarKFoRce was hatching a plan of his own. Soon, the map was swarming with bug-like creatures. Announcer: "It looks very bad." Then the verdict: "Game over," said a message on the screen. He took off his green headphones and dropped them on the desk in defeat. He looked stunned. Thinking his time at the games was done, he walked across the convention center, head down, seeming oblivious to the circling spotlights and blaring music. He quietly unpacked his keyboard at another station and, like a swimmer cooling down in a lap pool -- or an addict looking for one more fix -- started playing the game all over again. He found opponents outside the tournament who would play him on the Internet, sometimes at random. His Korean rival, MVP, walked up behind him. "Did you hear that? Young-jin just lost," he said, referring to another high-ranked player. "If I'm in first place and you are second place, you and I will meet up in the semifinals," MVP told him. "It's not confirmed yet, but we may play again." It was a strange and unexpected twist of fate. Because the other players in MarineKing's bracket had performed poorly, too, MarineKing wasn't out of the tournament just yet. Before he could relax, however, he had to win another match. And, as usual, he was anxious to get started. He typed that word and hit enter a total of 59 times before he got a response. "You want to start?" his opponent wrote. Quite the understatement. MarineKing easily won the match -- in less than eight minutes. Despite the loss, he would advance to the quarterfinals. After the win, a fan walked up to MarineKing's playing station to offer her congratulations. "You have to win," she said, clutching an armful of gifts -- a box of soymilk, chocolates and a piece of cake, which she handed over with a crisp bow. Overwhelmed by the celebrity encounter, she turned away and cried. The pressure was ratcheting up. Not only would MarineKing have to win for his fans, but the next morning the audience would contain two important sets of eyes: those of his parents. South Koreans to 'step up to the mic' and tell CNN why they believe South Koreans are obsessed with gaming. 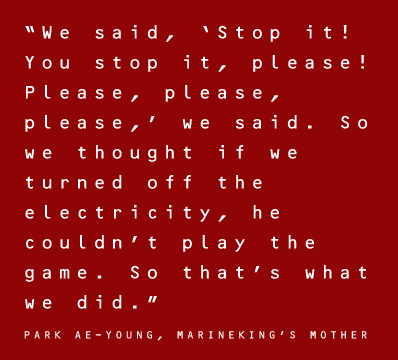 MarineKing's parents succeeded at first by cutting off the power in their apartment to stop their son from playing "StarCraft II." Eventually, however, he found ways to circumvent their ban. So his mother and father decided to try another tactic: Against his will, they sent their son to a meditation center near Seoul, several hours by bus to the north. There were no games at the center; no Internet, television or cell phone use either. The goal was to yank out the cords that connected MarineKing to the digital world. It wasn't the most extreme treatment choice available. The Korean government spends about $10 million (11.5 billion won) per year on a network of Internet and gaming addiction treatment centers, according to officials. At some of the counseling centers, kids do arts and crafts and talk about the perils of gaming too long or too hard. At others, suspected addicts are sent away to 10-day Internet-free camps where they're forced to quit the habit cold turkey. In place of games, they do physical exercise, since both of those activities have been shown to produce a release of the pleasure hormone dopamine, said Dr. Han Doug-hyun, a psychiatrist and researcher at Chung-Ang University Hospital in Seoul. Han's hospital also is home to an experimental "virtual-reality" treatment that forces players to confront recordings of their loved ones yelling at them and saying how the games have ruined their lives, too. The treatment also puts players face-to-face with 3-D videos of the games they play. The screen suddenly cuts to a dark hallway and screams emit from the televisions. The idea is to pair negative experiences with the games, he said. The result feels like something out of the dystopian movie "A Clockwork Orange." There are prevention programs, too. 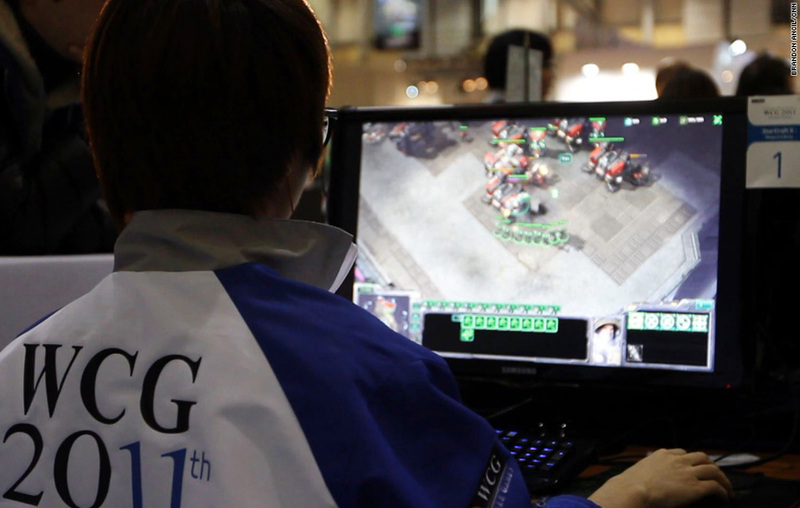 In November, South Korea imposed a national curfew on online gaming for people younger than 16. They're no longer allowed to play online games from midnight to 6 a.m., although the law is being challenged in court. And in school, kids are taught not only to be wary of drug and alcohol addiction, but digital addiction as well. Other countries, including China, have tried to treat gaming addiction. South Korea, however, is regarded as the world's leader in combating addiction. It's unclear how well the treatment programs are working, if at all, but the government reports a drop in the number of young addicts over the past few years. It could be a window into what other less technologically developed countries will face. Or, as critics say, it could be a waste of energy and money. Some psychologists, both in South Korea and abroad, question the legitimacy of gaming and Internet addiction as diseases. And treatment, of course, has mixed results. CNN: Is 'gaming addiction' a real disorder? MarineKing's non-clinical treatment at the meditation center didn't work as planned. It kept him away from "StarCraft," sure, but he spent much of his time there visualizing the game -- wishing he could play. When he came home, MarineKing's parents once again heard the familiar rattle of his keyboard through the night. Their feud came to a head in October 2008, when MarineKing was 15. After a heated shouting match, MarineKing's parents decided to throw their son out of the home. Lee Hang-jae, his father, pushed him out of the door and locked it behind him. His mom, somewhat remorseful, peeked out to see where her son would go. She watched in horror as the elevator climbed to the top floor of their building. She worried he would jump to his death. "I was freaked out," she said through a translator. "But a few minutes later, he went down to first floor and went to security office." MarineKing spent several hours in that office, not sure where else to go. He never considered committing suicide, he later told me. He needed to get some air. His parents let him come back into their home later that night. But after that, MarineKing would make a secret promise to himself: He decided to give himself one chance -- one tournament -- to see if he could become a professional gamer. If he won, conquering a field of several hundred "StarCraft II" players, he would follow that path as far as it would lead. If he lost, he would try to give up "StarCraft" and become a lawyer or a judge, like his parents wanted. He boarded a bus to Seoul. This time, it would be all or nothing. The next morning, MarineKing's mom walked into her son's room empty. She didn't know where he could be. She panicked. She remained in a state of distress until her son returned to the apartment several days later with a certificate in hand. He'd won a major tournament, he told them. That win, in April 2009, made it official: He was a pro gamer, whether they liked it or not. At first, they didn't accept this new reality. But they softened over a long, tearful conversation in MarineKing's bedroom the night he returned. They agreed to let him pursue this career -- moving to Seoul so he could train. "I never realized how good he was," his mom later told me. But his father put one condition on this agreement. If you're going to be a gamer, he told his son, you have to be the best in the world. MarineKing's parents used to do everything they could to stop their son from playing "StarCraft." But on the third day of the World Cyber Games, they were sitting in the front row, their faces expressionless. His father wore a suit, tie and slicked-back hair. His mother clutched a purse on her lap and sat with the at-attention posture of a Catholic school student. They were in the audience to watch their son get a second chance. After thinking he was eliminated from the World Cyber Games, MarineKing again was up on the main stage -- with its soundproof pods and jumbo screen. He hoped to show his parents how far he'd come and how well he was doing on the international circuit. That he was, in fact, the best. Only 16 "StarCraft II" players remained in the tournament; MarineKing knew if he could advance to WCG's version of the Final Four, he would have a chance to play MVP, his rival, and the only player at the tournament ranked higher. It would be the ultimate yin-and-yang match-up -- MarineKing, who attacks aggressively and without pause, versus MVP, who waits to see his opponent's strategy and then uses it against him. MarineKing, whose parents did everything they could to stop him from playing "StarCraft II," and MVP, whose parents saw that he wasn't excelling in school and enrolled him in an after-school academy for "StarCraft" players because they wanted him to go pro. MarineKing, who bangs on a black keyboard and MVP, whose manicured-looking fingers seem to float over white keys. But to get to MVP, MarineKing still had to get past some other opponents. First he faced an Australian player named mOOnGLaDe. Watching from an audience of hundreds, MarineKing's mother gasped when her son lost the first round of the best-of-three match with the lesser-ranked opponent. But MarineKing wouldn't let that happen again. He beat mOOnGLaDe handily in the next two rounds, winning the match. Finally breaking their stoic poses, MarineKing's parents stood and applauded wildly at the come-from-behind victory that advanced MarineKing to the Round of 8. After the match, mother, father and son went to a traditional Korean lunch at a restaurant in the basement of the conference center. MarineKing's mother brought along two of her son's screaming fans whom she'd met in the crowd earlier that day. Sitting on the floor at a shin-high table and eating stew, rice and the pickled cabbage dish kimchi, MarineKing's mom rubbed her son's back and tried to calm his nerves. "He's still growing," she said, beaming with pride. "He's my baby." Her son was already thinking ahead. "I have to focus on MVP," he said. Before MarineKing could meet MVP, though, he would have to play one more match. He would face a relatively unknown Ukrainian player named Kas. Over lunch his dad, who has become well-versed enough in "StarCraft" strategy to engage in lengthy conversations about troop movements, attack formations and character choices, tried to help MarineKing with his strategy against MVP. MarineKing's dad now calls his son by his screen name, even in private conversation. Since attacking MVP with all of his forces at the start of the match hadn't worked in the past, father and son decided MarineKing should try something new. He would need to play a brainier game than usual. At the start of the match with Kas, MarineKing ran through all his normal routines: the fidgety keyboard runs, the frantic badgering of his opponent to get ready and start the game. He tapped on the table impatiently. Soon the game began. "StarCraft II" lets players face each other on several boards. This one looked like an abandoned city in outer space -- broken neon signs, trees stripped of their bark, cracked pavement and dark skyscrapers in the distance. The board seemed to foreshadow the outcome: MarineKing lost the first round of three, putting his head on his hands and letting out a deep breath, trying to regroup. He would have to win the next two rounds to advance. Round 2: MarineKing's opponent set up a base in the top right board of the board. Thirteen minutes into the game, they engaged in a quick battle there, before retreating. Just before the 19-minute mark, Kas ambushed MarineKing, swarming his base. MarineKing couldn't recover. His base exploded. "gg," or good game, MarineKing wrote to his opponent just before the screen went black. MarineKing slumped in his seat for an uncomfortable period of time before emerging with watery eyes. This is how his mother found him after the match. Not the world champion. Just a player. She patted him on the back and told him it would be OK.
On Twitter he posted a message to his fans: "I'm sorry." I asked MarineKing if he ever thought about quitting "StarCraft II." The game had caused his family such strife, and he hadn't been able to fully meet their expectation that, if he pursued pro gaming as a career, he had to be the No. 1 player. "I mean, of course there are times when I have a really hard time -- especially today. And I feel depressed and sad but right there there are fans who are cheering for me and are very supportive, so I never thought about quitting," he said. "Unless I'm forced to quit." He expressed regret at not performing better in front of his parents. "I wanted to show them the moment I was going to win." Ultimately, it didn't matter. They'd realized sometime ago how much the game means to him. And they could see its impact: He was happy, driven. His father thinks the game actually could help broaden his perspective. "I already had a long talk with the coach," he said after the game. "By next year, he's going to graduate from high school. After that, we hope he can play in the world leagues -- not just in Korea." After the tournament, I talked with the psychologist, Dr. Han, about gaming addiction in Korea. I described MarineKing's training habits, and his personal story. He said the number of hours and the intensity with which he approaches "StarCraft II" borders on addiction. But there's one difference, he said. Pro gamers usually aren't addicts. Addicts can't succeed on a higher competitive level, he said. The game takes complete control. Pros, however, find a magical balance. They're obsessed with the game, maybe, but their playing of it isn't depressive, meandering and hopeless. They're chasing after a goal. After MarineKing collected himself, he went to talk to his teammate, MVP, who would meet Kas, the player who defeated MarineKing, in the semi-finals. "You've got to be aggressive," he told him. That always had been his tactic. He hoped it could help his Korean teammate. It did. MVP, the player whose parents had sent him to a video game training camp when he was young, and who always supported his habit, beat Kas in the semi-finals -- and went on to win the championship set, against a Chinese opponent, 2-0. He was the world champion. The first person to rush the stage after the win was MarineKing. The rivals hugged and then held the Korean flag, together in triumph. Translations by Jin Kang, Sindy Kang, Yoonjung Seo, Soo Bin Park. Narration by Emma Lacey-Bordeaux/CNN Radio. MarineKing and MVP embrace after the final "StarCraft II" match at the World Cyber Games in South Korea.